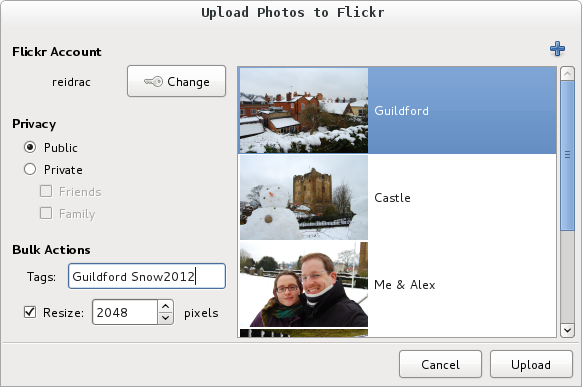 This application is Free Software (GPL version 3) and uses the Flickr API, but is not endorsed or certified by Flickr. Photos can be added from the file browser, with drag & drop or from the application built-in dialog. Title editing (after uploading the files the application will open Flickr with your default browser so you can review the uploaded content). Privacy options (public, private, with friends and/or family flags). Tagging and image resize on the fly. No further development is planned. If you’re interested in continuing the project, please contact me! Select the pictures you want to upload to Flickr on your file browser and right click to open them with this application, and you’re done. Easy and neat. Alternatively you can add more pictures using the application interface or drag & drop pictures from your file browser or other applications. You can check this screencast showing basic usage (version 0.01), or this screencast showing drag and drop (version 0.07). You can also take a look to the new authorization based on OAuth (0.11 and later). Important: Flickr has updated all API endpoints to fully support SSL, and the non-SSL endpoints will stop working at the end of June 2014. Nautilus Flickr Uploader version 0.15 (and later) supports SSL, please upgrade! Note: it may work in Ubuntu Lucid (or later) and Debian Squeeze (or later). Thanks to Jose Fco. Irles Durá for his help with the DEB package! You may find alternative Ubuntu packages at getdeb. Read INSTALL file for instructions.